Roll up your sleeves, don a bib and prepare to get your hands dirty! 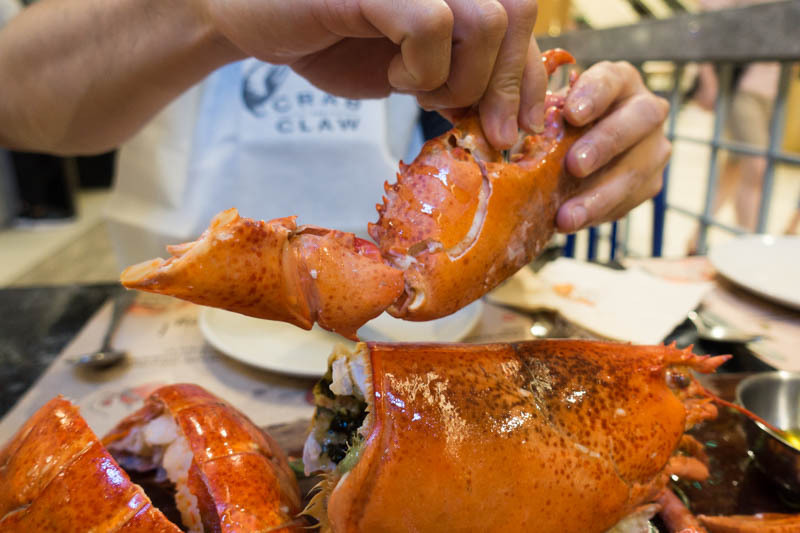 Crab And Claw serves up authentic New England-style seafood such as whole Maine lobsters that are the size of your arm, crab buckets, lobster rolls and more. 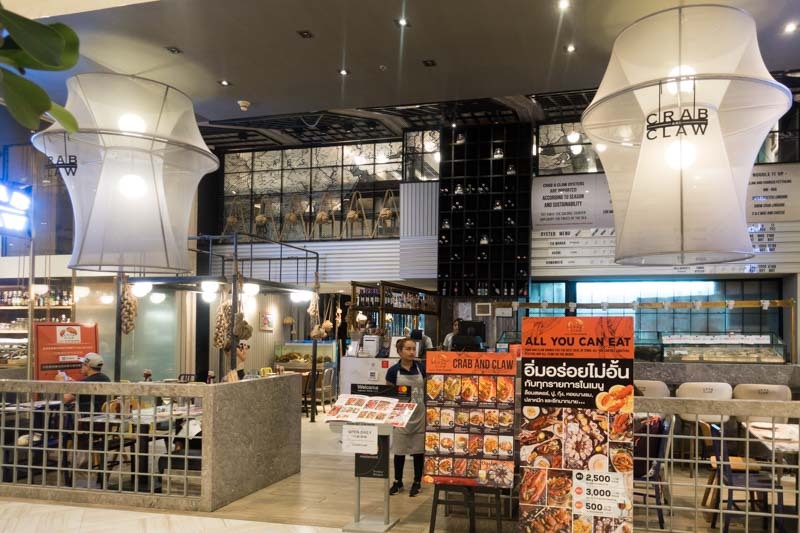 Located inside Siam Paragon in Bangkok, this cosy seafood restaurant imports live Maine lobsters daily, so you’ll be sure to have the freshest catch for your meal. Plus, if you’re up for a challenge, they even have all-you-can-eat promotions. 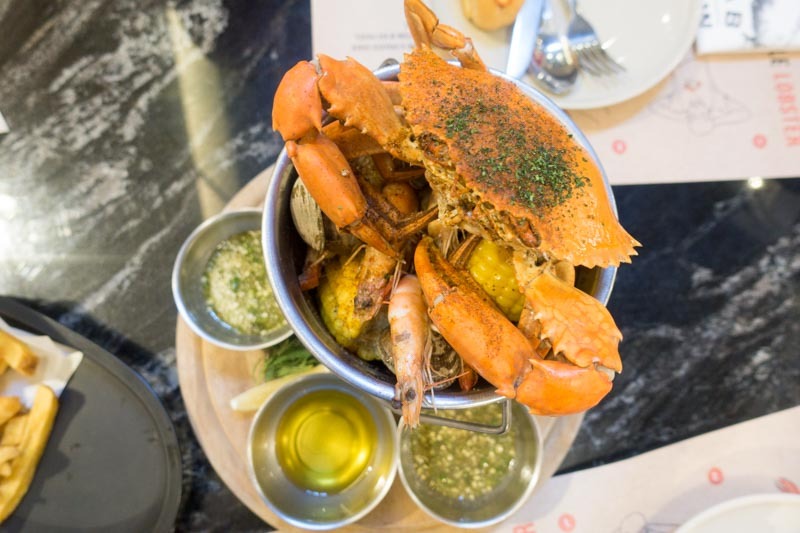 Its Set 1 (THB2,500/pax) includes all crustaceans excluding oysters, Set 2 (THB3,000/pax) covers all crustaceans, and Set 3 (THB500/pax) is for free-flow wine. 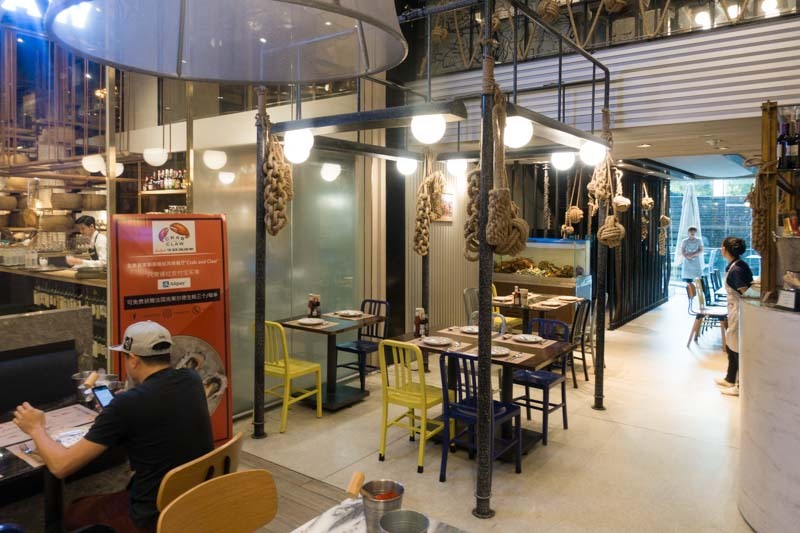 The restaurant is split across two floors, with nautical-themed decorations such as draping ropes and hanging lobster nets. The space itself was spacious, air-conditioned and clean. Every table had hammers for you to crack your crustaceans, and buckets for you to throw the empty shells away. A must-order when you’re at Crab and Claw, the C&C Lobster Roll (THB950) is the restaurant’s take on New England’s lobster roll. 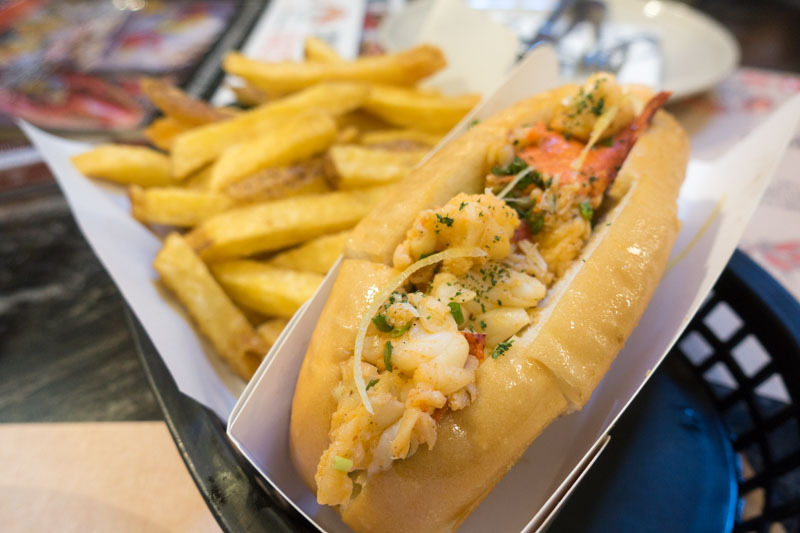 More often than not, lobster rolls are covered in mayonnaise and you end up eating more sauce than meat, but Crab and Claw’s rendition of this classic dish was authentic and traditional. Chilled chunks of Maine lobster meat were tucked between a toasted bun, and topped off with lemon zest and fresh herbs. It was also served with chunky french fries. For its hefty price, I would have loved more lobster meat in my roll. 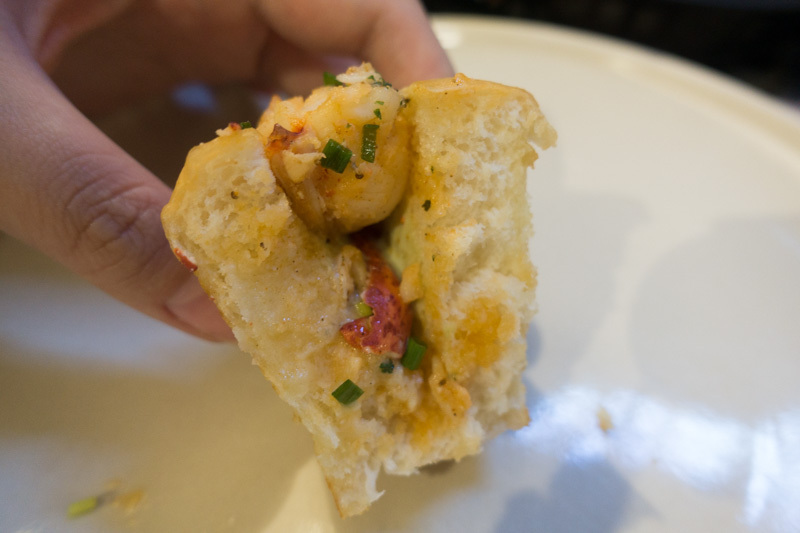 However, one thing I really liked about the lobster roll was how naturally sweet the lobster meat was. Firm and juicy with a slightly buttery aftertaste, it went really well with the toasted bun, which was glistening on the outside but moist and soft on the inside. 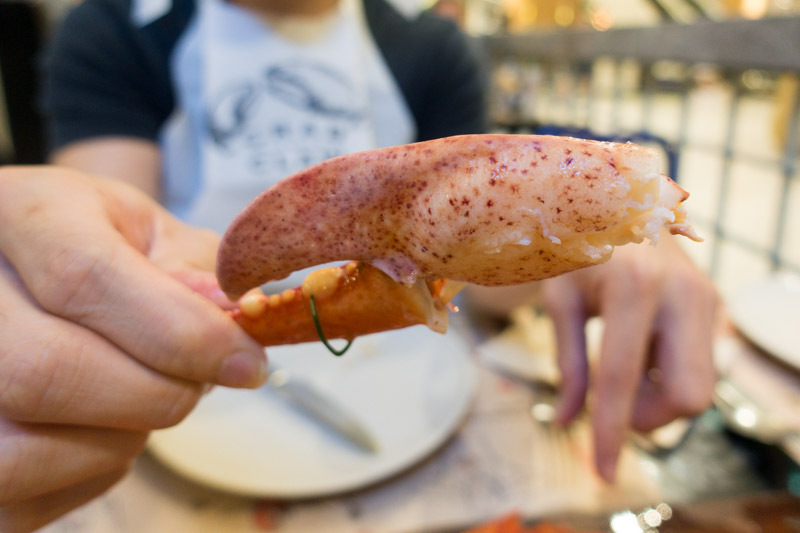 We weren’t kidding when we said that Crab and Claw’s Maine lobster is as big as your arm. In fact, it might even be bigger! It was served with “drawn” butter, which is an English term for melted butter. The Classic Steamed Whole Lobster (THB2,900 for 1000 – 1300 grams, THB1,900 for 700 – 800 grams) was so huge we weren’t sure how to start eating it. Thankfully, our table mats had instructions on how to dig into our lobster, starting with plucking out its claws and cracking open its body. It really took some skill to get to the lobster’s flesh, but it was soo worth it. 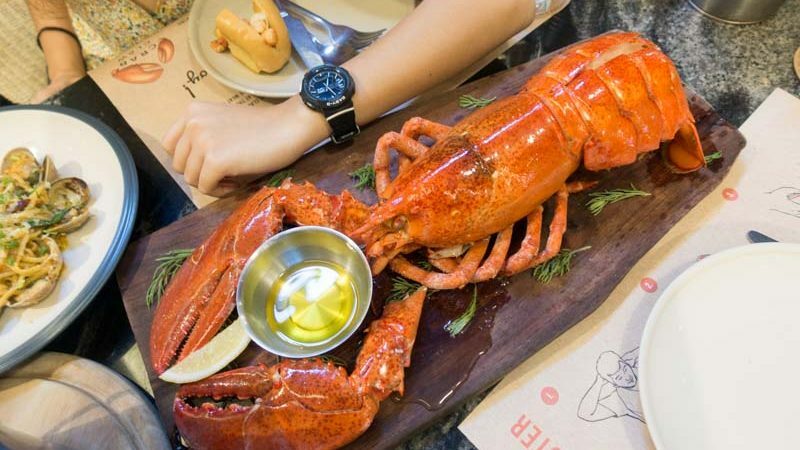 The classic steamed lobster was au naturale — so natural in fact that it came with black poop, so do keep that in mind if you’re ordering this on your next visit! I’ve got to say, the lobster meat was super sweet – you can really taste the natural goodness of the meat. It was firm and bouncy to the touch, but I bit into it easily and was delighted to find that the meat was soft and juicy. Dipping it in melted butter made the meat silky smooth and rich. What I enjoyed in particular was having the lobster served whole. This way, we got to eat large pieces of lobster meat as compared to bits and pieces from individual lobster parts. That’s not something you get to do very often! You can also choose to order your whole lobster grilled or baked in organic uni butter. The latter is topped with organic uni roe and flying fish roe for the ultimate indulgent treat! The New England Crab Boil (THB1,200) was a large bucket that came with Manila clams, shrimp, spicy pork sausage, potato and corn on the cob. Don’t underestimate the size of this bucket — I counted at least 15 prawns and more than two dozen Manila clams. It came with three dips: melted butter, butter and garlic & butter and herbs. I’m the type of girl who loves her clams, so needless to say, I voluntarily finished all of them. What I really liked about Crab and Claw’s clams were how clean they tasted — they weren’t briny nor were there any accidental dirt grains. They were also seasoned lightly with paprika for an extra kick. 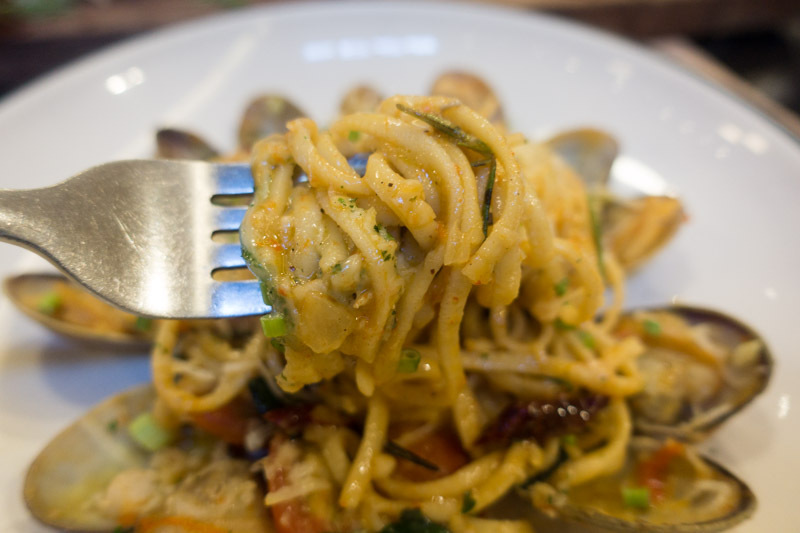 The Spicy Clam Linguine (THB290) came with home-made linguine, Manila clams, dried chillies and cherry tomatoes, and was topped off with shredded cheese and chives. While I felt that the pasta could’ve used a little bit more salt and the sauce was more watery than expected, the pasta noodles itself were firm to the bite. The melted cheese also really helped to hold the entire dish together. 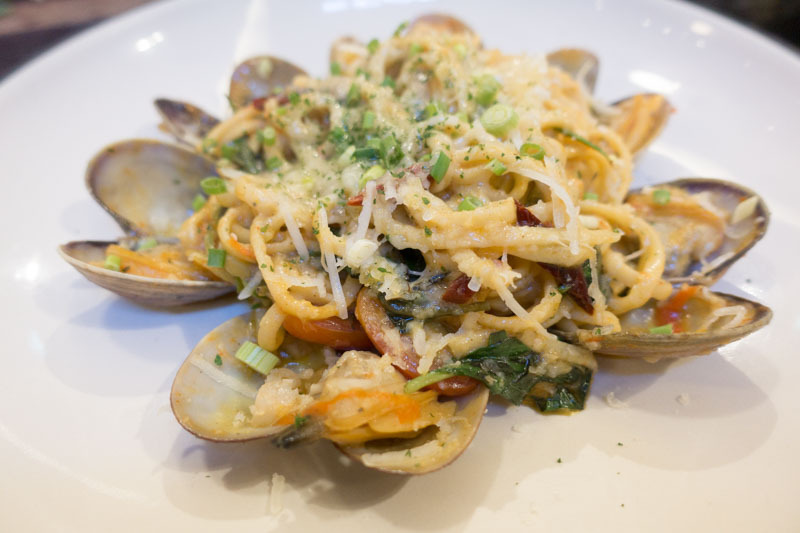 It was slightly peppery but not overly spicy, and I liked that they were generous with the Manila clams as well — I counted eight! This was by far my priciest meal in Bangkok and for its price, I expected a lot more. Though the gigantic whole lobster is certainly impressive, it’s not something I would spend close to S$130 on. 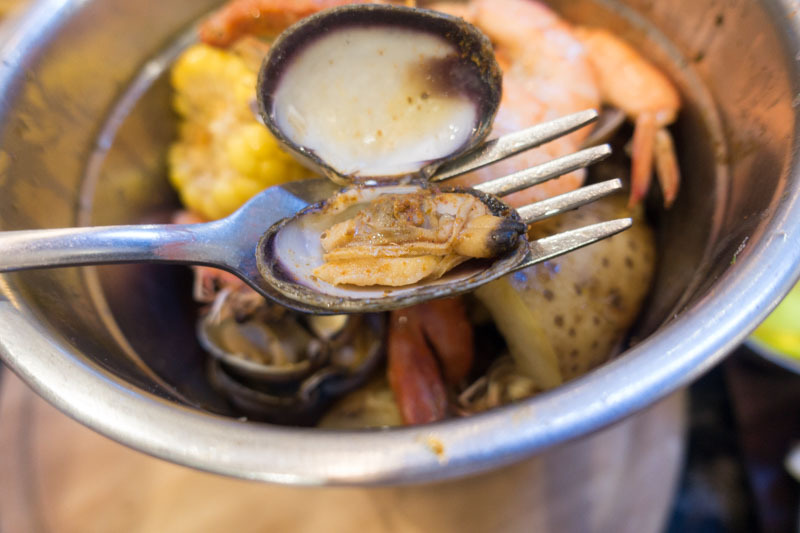 However, I did appreciate that I was able to enjoy authentic and clean seafood within an air-conditioned environment, and there’s no doubt that the seafood that Crab and Claw served was of high quality. Perhaps the next time I’m here, I’ll go for the all-you-can-eat buffets instead as they definitely seem more worth it in terms of price and quantity.